This is one of the cards I sent for Christmas this year, and it is my favorite (even though one had a photo of our oldest cat Jenny on it!) 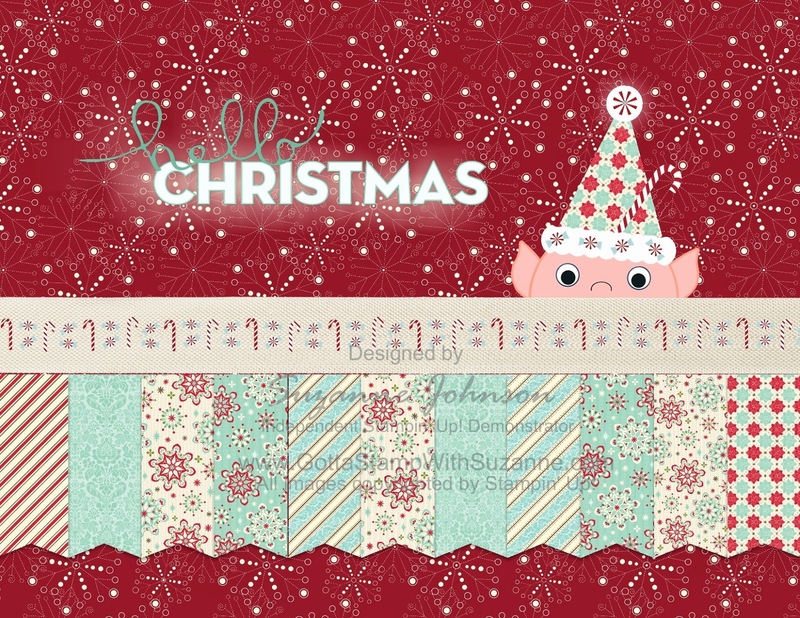 This card was created entirely with My Digital Studio elements. It is digital punch art! I started off wanting to incorporate some of my mini-banners (the same that I have had printed and am offering on my Boutique page). So, you could CASE this card and create a more traditional version of it with the printed banner pieces, punch art, DSP and stamps of your choice. Creating this digitally with MDS was lots of fun! As soon as I placed my row of banners, the idea of a little elf peeking over the edge popped into my imagination. I added the Seam Binding Ribbon along the top edge of the banners to give it a more finished look, and layered the candy cane & peppermint Savor the Season embellishments on top. I put peppermints and the candy cane from the on his hat. The punches used to make the elf are an oval, bird wings, pennant, and circle. His nose is the outline circle stamp image from the School Days stampbrush set, cropped to a half circle. The sentiment is an embellishment from Jingle and Joy that I recolored with Pool Party - doing that magically made the solid color word "Christmas" turn white! I dropped a white shadow with full blur and opacity to it. The background DSP is Pattern 1 from Christmas Cheer.